In this week’s bulletin, the Eco-sabbath, Good Friday collection and A Lenten Exodus. Stations of the Cross will take place each Friday evening during Lent at 7:30 PM. We also encourage your attendance at our daily Mass throughout Lent. This is an opportunity to spend some time in peace and quiet, to reflect upon how we are responding to our call to be sons and daughters of God. Recognizing the fact that we are “good people”, we also accept the fact that good people can sin. Through an examination of conscience we face those sins, admit them and are reconciled to God. For those who wish, individual confessions will be celebrated after the service. We encourage you to take advantage of this celebration. This annual parish event is again being sponsored by the Pastoral team. Passover is the oldest festival of the Hebrew liturgical calendar. It has been observed by the Jewish people for more than 3,000 years. Passover is a religious family meal celebrating Jewish freedom from slavery. It occurs in the spring, the time of renewal in “Nissan”, the first month of the Hebrew year, and it lasts for eight days. Why do we celebrate this “meal” at St. Gabriel’s? First, this celebration helps us to understand our religious roots, which are Jewish. Second, it is an opportunity for us to celebrate our growth as a community and be together with families and friends at this most special time during Holy Week. Please call the Parish Office at 416-221-8866 by Friday, March 30th to book your table of 6 or 8, or to have your name added to a table. 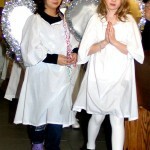 These children received the Sacrament of Baptism on Sunday, March 18th 2012. Congratulations! On the first Sunday of each month, the Passionist Centre for Ecology and Spirituality facilitates a 30 minute reflection and discussion prompted by the readings for that Sunday’s liturgy. All are welcome. In anticipation of the arrival of the Iraqi refugee family sponsored by the Parish, the Refugee Sponsorship Committee is trying to identify someone in the parish who speaks Arabic, who may be able to help interpret/translate as when need arises. Please call Fatima Lee at (416) 221-8866 ext 228 or email her at fatimalee@bellnet.ca if you are able to assist. “You don’t have to look far to see the wonders being worked by ShareLife in your neighbourhood, in the homes on your street, in the pews of your parish. ShareLife agencies provide competent, faith-informed care to those who turn to them for help, regardless of their beliefs or background. During the Good Friday Service, our parish in communion with the Church turns itself towards Jerusalem. It commemorates Jesus, his sorrowful passion and his love for us and all humanity. That is also where we share a common solidarity towards the Holy Sites and the faithful who live there. Our gesture of solidarity becomes an extension of the Pope’s hand that reaches out to the Holy Sites where Jesus has lived and given testimony. On Good Friday, there will be a Pontifical collection for the Holy Land in support of Christian communities, the work of the Holy Land, the upkeep of the Holy Sites and the formation of future priests. Let us give generously and show solidarity to respond to the needs of the Church in the land of Jesus. To raise funds for the Marguerite Bourgeoys Family Centre, the Youth Group of St. Gabriel’s will once again be selling hand-made chocolate Easter eggs for $3.00 each or 2 for $5.00 before and after all the Masses on March 31st/April 1st . The Centre offers a wide range of services to meet the health needs of women in all stages of life. 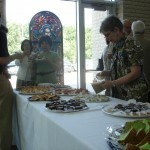 Your support will help the Centre promote and maintain their service in the Diocese. 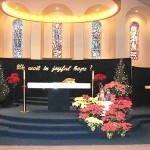 The Parish’s 2011 financial statements will be included in the bulletin for next Sunday, April 1st. Please ensure you read it. Scarboro Missions welcomes you to commune with God to hear the cries of the world in a deeper way. Rev. Leshy Paynter, Pastor in New Hampshire returns to Toronto from South Africa with a Message from his people. Regis College is holding its first Annual Used Book Sale on April 18–21st at the College, 100 Wellesley St. West. We are accepting all categories of gently used books – soft and hard covers. If you wish to donate your books to our sale we ask that you bring them to the College during regular school hours. All proceeds will be directed towards financial support of furthering the education of young Jesuits and lay students. For more information please call (416) 922-5474 ext.244; or go online to booksale@regiscollege.ca or www.regiscollege.ca/booksale . We welcome your support. 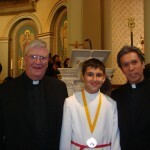 This Bulletin entry was posted on Sunday, March 25th, 2012.